Just know, when you are collecting or investing in a CGC Stan Lee Signature comic, you own a unique, timeless treasure that will forever set your book apart from all the rest, and as time goes on, become an even more respected and valued piece of Comic History. Stan Lee is revered by comic fans as the savior who revitalized a near-dead comic industry in the early 1960’s. Prior to the creation of Marvel Comics, the super-hero comic industry was dominated by what had become an unimaginative stale DC Comics line of hokey super-heroes. With Stan Lee’s creation of exciting and iconic heroes like Spider-Man, The Fantastic Four, Hulk, Iron-Man, and other unique characters, interest in comic books exploded into a world-wide phenomenon and ultimately the collectible industry's counterpart to Baseball Cards. What Mickey Mantle, Babe Ruth and Michael Jordan did for sports cards pales in comparison to Stan Lee’s achievements in the comic book world. He literally created THE industry as we know it today! It’s been 50 years since Stan Lee introduced Marvel’s creativity … and the comic industry has never looked back. Imagine, if you will, owning one of just a few of the absolute highest graded 1952 Topps Mickey Mantle Rookies or 1986/87 Fleer Michael Jordan Rookies. That’s a nice chunk of change to say the least. Now, imagine if you owned a GENUINE CERTIFIED AUTOGRAPHED version of that same card. Something great, now enhanced by the very individual himself, in his own hand, has become something truly irreplaceable, with immense increased value. Stan Lee is over 95 years young, born on 12/18/22, God bless him. Though one of the most vibrant people you’ll ever meet, at some point Stan is going to retire from the signing business. It’s time consuming and tiring even for young athletes directly out of college. Sometime in the near future, Stan Lee is going to put down the pen and enjoy his golden years. The fact is; only a finite number of Stan Lee signed comics exist. Sometime, in the not too distant future, that will be a fixed number. Once he stops signing that’s it. CGC, the unquestioned leader in the comic book grading and certification industry, exclusively grades and slabs all of our comics Stan Lee signs. Unlike the sports cards or other signed memorabilia, there is no question of forgery. 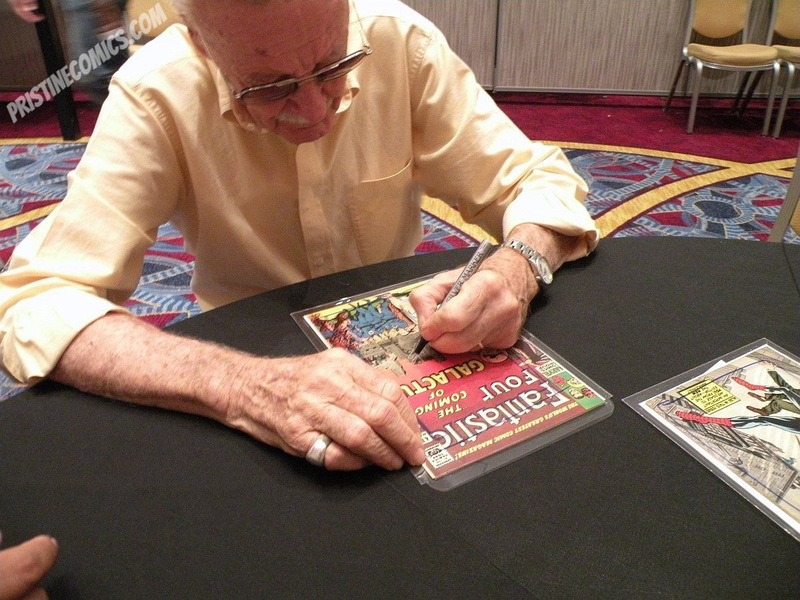 A CGC representative must be present when Stan Lee signs a comic, or they will not certify it. If a comic were to be signed by Stan Lee and then later sent to CGC for certification, CGC would not certify it, as they must witness the signing in person. CGC offers something that other autograph certification companies simply do not; AN ABSOLUTE GUARANTEE THAT THE CERTIFIED ITEM IS INDEED REAL AND GENUINE. Once Joltin Joe DiMaggio decided stop signing, and after Mickey Mantle’s passing, demand for anything autographed by either of them skyrocketed. Unfortunately, so did the supply of new items they “supposedly signed”. Imagine how much an autographed baseball, of either of these two legends, might be worth today, if indeed, no fakes were on the market, if demand remained the same, and supply was reduced by 70%? Some experts feel a $400 baseball today would be worth at least $2,000 or more. The fact is, many of you, myself included, look at your favorite comic with awe and appreciation. Especially with a certified & preserved copy signed by the Man himself. Every signature, as well as it’s placement on the comic, is unique and assures you, regardless of grade, an original piece, never to be duplicated. It’s the next best thing to original art, and still affordable.